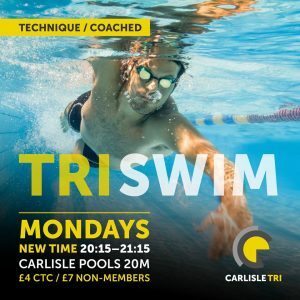 Monday Swim: £4 CTC members / £7 non-members Monday’s swim session (8:15pm Carlisle Pools (20m) ) is a coached session focusing on technique and is suitable for swimmers of all abilities, this is a great opportunity to improve your swim technique in a friendly and supportive environment. Please meet 15 mins before the session starts to sign in and get changed. 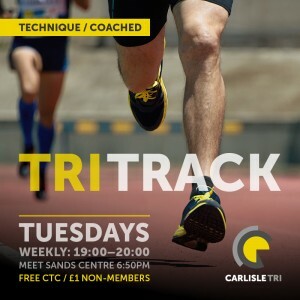 Tuesday Run: FREE CTC members / £1 non-members Plus entry to the track if you do not have a GLL card. Tuesday’s run session is also coached. 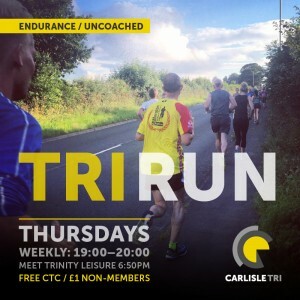 Meeting at the Sands Centre at 6:50pm for a 7pm start, the session focuses on speed work – and is suitable for all paces. If you do not have a GLL card you will have to pay to use the Sheepmount. 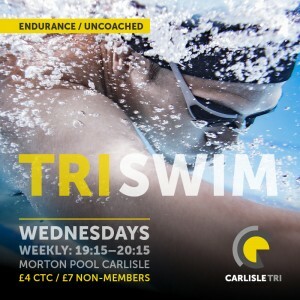 Wednesday Swim: £4 CTC members / £7 non-members Wednesday swim session at Morton Pool is uncoached, 7:15pm. Planned sessions are available poolside.